During the week of Thanksgiving, I spoke at a conference at the State Art Academy in Stuttgart. Titled The Illustration Impulse, the conference was devoted to exploring the culture of illustration, perhaps as a means to relocating a sense of social engagement in picture-making. There's much more to say about the day, and I hope to get back to it before long. The event was organized by Alexander Roob and Patrick Thomas. I met Patrick that day. Alex was already known to me. I reached out to him late in the summer of 2013, when my Parisian sojourn was wrapping up. At his invitation I traveled to Dusseldorf where he and his companion Ursula live. We share deep historical interests, curatorial/collecting proclivities and exasperation with the high visual culture of our time. Alex is a professor at the Stuttgart Academy. Lori and I were in Germany for about a week, dividing time between Stuttgart, Dusseldorf and–briefly–Cologne. On Wednesday, the day following my talk, we returned to a church we'd briefly seen two days earlier, the Stiftskirche or Collegiate Church of Stuttgart. ("Collegiate" refers to a college of local canons, not an educational institution.) We went back because I wanted to draw the nativity figures, possibly for a holiday card. The church has really stuck with me. Initially a Catholic church (begun in 1175, completed 1463) the Stiftskirche became the first Reformed congregation in the city in 1534. When they rebuilt the church after World War II, they did so in an unmistakable spirit of penitence. The stained glass windows along the north wall of the nave are colored gray, brown, cloudy white and black, showing the Hebrew prophets: Isaiah, Ezekiel, others. The sobriety of the palette has a confessional effect. “We repent,” those windows seem to say. There are other somber touches, and joyful moments in other nooks. But the Stiftskirche is a self-described “Good Friday” church. You feel it. I was genuinely moved by the place, and over a period of weeks pondered its humility. As anyone with access to the wider world knows, this has been a challenging year in St. Louis. The killing of Michael Brown outraged many here, crystallizing longstanding grievances. Ferguson exploded for a reason. Though many American cities have had such problems, St. Louis’ sins are particular. By virtue of the Missouri Compromise, Missouri was the last slave state, and St. Louis was a significant slave trading hub. It’s not widely known that one of the worst race riots in American history took place across the river in East St. Louis in 1917, when an unknown number of Southern blacks (at least 100, maybe 200) who had migrated to fill wartime jobs were killed by white mobs, some by lynching. The city’s restrictive housing covenants were written into private agreements before World War I; it took a Supreme Court decision in 1948 to overturn them, after Missouri had found them legal. And of course, there's more. It’s a long, sad and intermittently brutal story. The wider national story seems little better. Then, to top all that off, the Senate Intelligence Committee report on the CIA’s interrogation program made clear (and as many had long been aware) we have war criminals walking around blustering proudly that the ends justify the means. Almost daily have I thought about that German church. Where is our repentance? The Praying Knight, an unattributed portrait of Herman von Saschsenheim (1430-1508). Stiftskirche, Stuttgart. Lori in a cafe on Olgastrasse. The Stiftskirche, Stuttgart. View from the rear of the church, dissimilar towers in view. 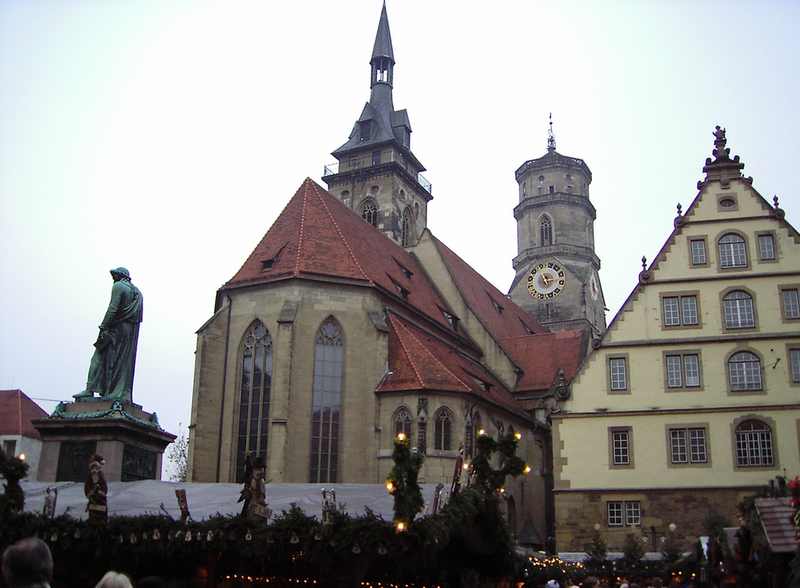 At left is a(n unrelated) statue of Schiller, surrounded by Christmas market stuff. Wikimedia Commons photograph by Joachim Köhler. The Stiftskirche after Allied bombings in May 1944. The Stiftskirche restored. A 1950s barrel vault slathered with asbestos was removed in favor of a gothic quotation in the vaulting and glass panels during a renovation completed in 2003. D.B. Dowd, Nativity, Stiftskirche. 2014. A late gothic scene bracketed by an Annunciation and the Adoration of the Magi; from a sequence that once ran around the church's choir screen. (Choir screens often featured early sculptural comic strips in late medieval churches; such screens divided the chancel from the nave.) Drawn in pencil onsite, inked upon my return in the few first days of December.